Label and Catalogue Number: Impulse! A-18. 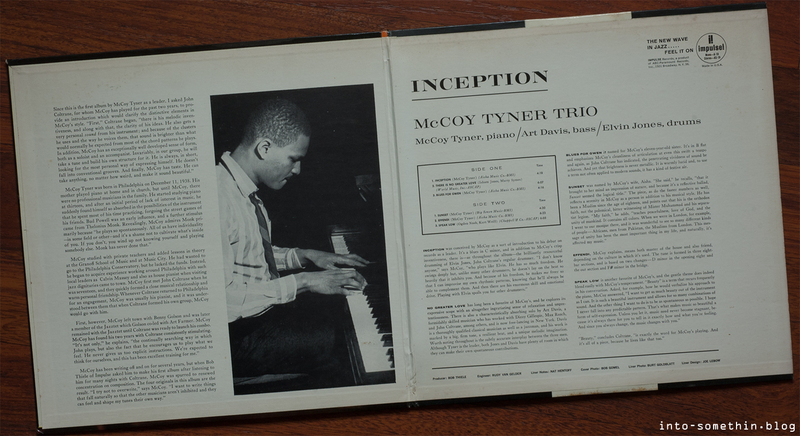 Personnel: McCoy Tyner (piano); Art Davis (bass); Elvin Jones (drums). Side 1: Inception; There is No Greater Love; Blues for Gwen. Side 2: Sunset; Effendi; Speak Low. Recording Date: 10-11 January 1962 at the Rudy Van Gelder Studio, Englewood Cliffs, New Jersey, USA. I have a love-hate relationship with piano trio LPs. Poorly conceived ones always run the risk of being an indulgent focus on the pianist or end up sounding a bit same-y on every track. The challenge, of course, is how to cook up a varied and interesting menu across forty or more minutes of music with only the three rhythm section ingredients at your disposal. Fortunately, there’s a small elite of pianists who seem to excel at leading in a trio format. Bill Evans springs to mind of course; Horace Parlan produced a string of convincing trio records at the start of his career and then returned to the format in his later years; and here we have another fine example of a performer who mastered this arrangement right from the outset. Whatever the genesis, Tyner’s apprenticeship with John Coltrane clearly imbued him with the necessary qualities to strike out on his own. There’s confidence and focus to Tyner’s work at the keyboard and his preparation of the compositions. From aptly named title track, through the dramatic yet pastoral flourishes of Sunset to the sprightly Blues for Gwen, Tyner shows he had already developed a voice of his own. Of course, the influence of his employer would inescapable for Tyner and this shows most obviously in the modalities of the record’s strongest track Effendi. The date is rounded out with two show tunes. The more conventional choice, Speak Low, is given some Latin figures to lend an air of intrigue while the infrequently heard There is No Greater Love receives a splendid jaunty treatment. Throughout the record we are treated by Davis’ pliant and elastic bass tone; Jones keeps firm control over his volcanic talents behind the drums to ensure an even balance is achieved between the three musicians. Tyner was to follow this trio formula for his next few Impulse! releases with a varied supporting cast but the same consistently impressive results. On checking my notes, I see this record was another of my forays into Discogs purchasing. In this instance, the seller was based in Italy and I recall carrying out my usual precaution of asking for photographs of the specific item before committing to the purchase. In my experience, such checks go a long way to ensuring a successful deal. 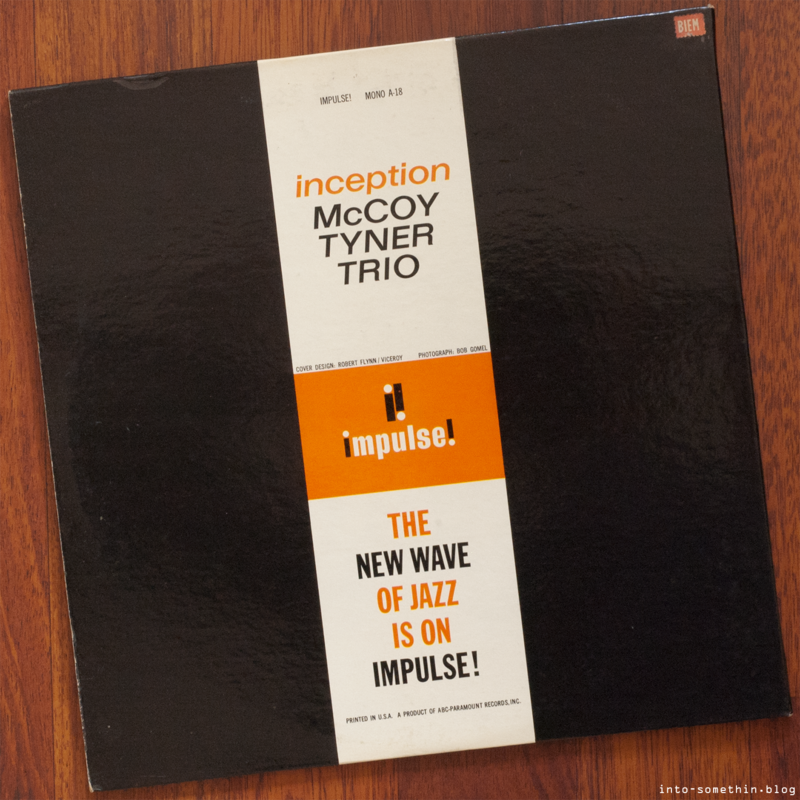 There was another promising McCoy Tyner Impulse! LP offered for sale at the same time from a different seller in Poland. This seller never responded to my request for photographs so I walked away from the deal. One of the joys of the classic Impulse! gatefold sleeves is the space that they afford for liner notes. On this occasion, the beneficiary is Nat Hentoff, who’s perceptive words are given room to breathe by the layout and photography of the design. This combination invites you in and gives you the impression of reading a glossy magazine feature article. Effectively, given Hentoff’s journalistic experience, that’s what’s actually happening anyway. 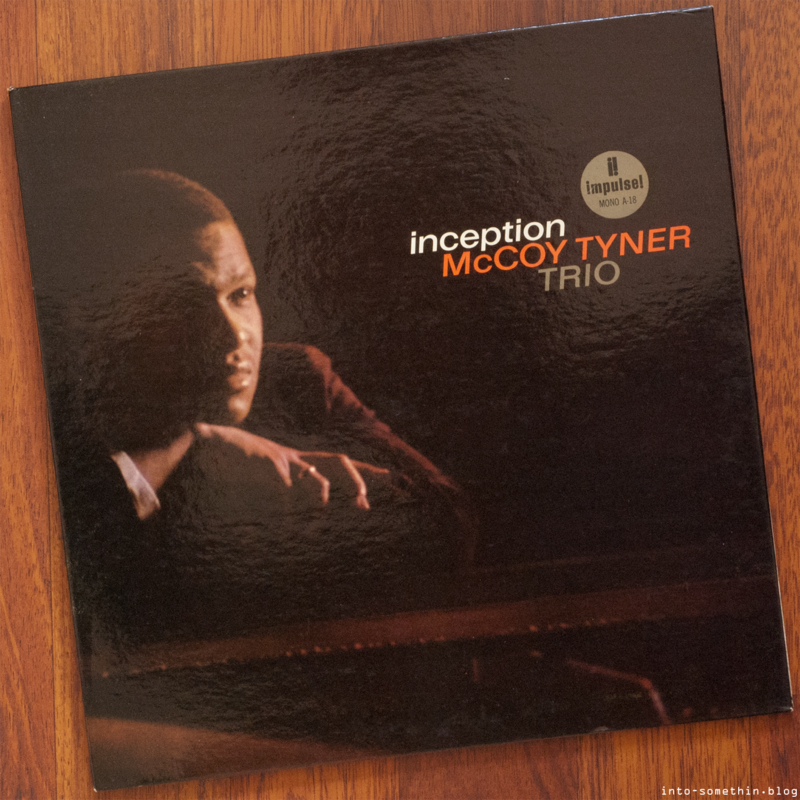 This being Tyner’s debut, Hentoff offers up some biographical background and sets this in the context of Tyner’s preceding two years as part of John Coltrane’s group. He goes so far as to seek an opinion from the master (no doubt facilitated by those involved with Impulse!) and is rewarded with some typically positive and kind remarks. We learn of Tyner’s appreciation for Bud Powell and especially Thelonious Monk. I would not have picked up this influence from Tyner’s playing alone but, on reflection, the connection through Coltrane makes sense. The second part of the notes is given over to discussion of the six tunes. As with several Coltrane records, the importance of family bonds shines through – Blues for Gwen being named for Tyner’s sister and the story of how his wife suggested the title for Sunset is recounted. The closing words are left for Coltrane himself who chooses one simple word to describe Tyner’s playing: beauty. Ah, the famous orange and black labels of the Impulse! brand. Both sides bear these iconic labels with the “A PRODUCT OF ABC-PARAMOUNT RECORDS, INC.” wording which, for such a low catalogue number (A-18), mark this example out as a second pressing. The correct wording for first pressing labels in this case would have been “A PRODUCT OF AM-PAR RECORD CORP.” Though, sonically, they are probably indistinguishable. The deadwax areas of both sides have “VAN GELDER” stamps and hand etched “LW” for the Longwear Plating Company. There’s a hand etched “A-18-A” matrix number on Side 1 and Side 2 has the equivalent “A-18-B” hand etched matrix number. The vinyl weighs 133g but, give4n I own only a few Impulse! LPs, I’m not in a position to comment on how hefty this is in context. Like all Impulse! records of this era, Inception comes with a beautiful laminated gatefold cover. This one is in lovely condition with just a few ageing marking and a BIEM sticker on the rear. An added bonus was the inclusion of the original inner sleeve. This provides further evidence this this isn’t a first pressing because it advertises later Impulse! 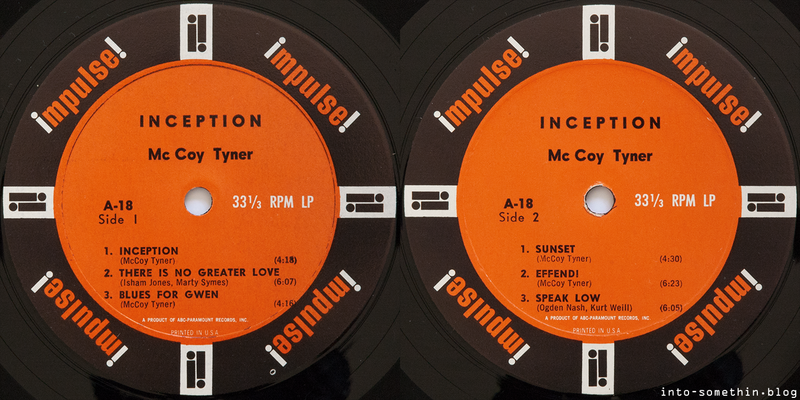 releases including Tyner’s follow-up record Reaching Fourth (Impulse! A-33). Overall then, a super example of an Impulse! mono second pressing.